Fred Harding takes a look at the new Premium Business Music Solutions (PBMS) including the three amplifier options and a series of music and paging mixers. The Premium Business Music Solutions (PBMS) product line includes loudspeakers for in-ceiling applications, pendant styles for open ceiling plans, as well as surface mounted speakers. QSC has been a presence in the pro audio and commercial audio realm for decades. They’re known for building robust amplifiers, great small venue mixing boards, and amplified and passive speakers for pro sound reinforcement applications. In recent years, they’ve aggressively worked on expanding their product offerings, first with their Q-Sys lineup, which includes video conferencing functionality and more, and most recently, with their Premium Business Music Solutions. The Premium Business Music Solutions (PBMS) product line includes loudspeakers for in-ceiling applications, pendant styles for open ceiling plans, as well as surface mounted speakers. This review will cover the electronic part of the PBMS lineup, which consists of uber configurable amplifiers and two audio matrix devices. The amplifier part of the equation will have three options: a two channel, four channel, and an eight-channel option. Each of the amplifiers is in a 1 rack unit chassis. The amplifier pairs are rated at 200 watts each, so you can get an 8 x 200 amplifier in a single rack unit space. What makes the QSC MP-A series amplifiers noteworthy are several things. First, you can have channel 1 operate at 70 (or 100) volt and channel 2 operate at a low (4 or 8 ohm) impedance level. That’s noteworthy, but not completely unique. The second feature, dubbed FlexAmp technology allows the installer to allocate resources as required. Essentially, take the pair of amplifier channels, (2 at 200 watts) and divide as needed. I can configure channel 1 to output 60 watts at 70 volts and channel 2 at 340 watts at the low impedance setting. It makes it really easy to designate the amount of power a zone or subsection of a zone receives. With 8 channels, I have four pairs of amplifiers available to manipulate, with all being different or all being the same. As long as the total power is 400 watts, you can manipulate as the job requires. These are Class D amplifiers and feature variable speed fans that are thermally controlled to run long and hard. Fact is, if you’re doing a background music system, those fans may never turn on. The front panel of all three models has LEDs to let you know if a signal is present at each channel, if the amp is in protect mode, muted, on or off, or in standby mode. The backside also has indicator lights for easy troubleshooting. There are relay contacts to indicate amplifier status externally. Balanced inputs are handled via removable Euroblock style connectors, as are the output connectors. If I were installing these amps, I’d make sure I have adequate illumination, because there’s a lot happening back there, and I want to do it right. QSC provides great documentation, and the times I’ve dealt with their tech support, it’s been responsive. They get it. The second part of the lineup I’m going to cover is the MP-M series of music and paging mixers. There are two options: the MP-M40 is a total of 8 inputs and 6 outputs, and the MP-M80 is a total of 16 inputs and 10 outputs. Those numbers are accurate, but require your attention, as the input count reflects both mono summed RCA pairs for consumer level audio equipment, as well as the same number of Euroblock connectors for balanced microphone or line inputs. Essentially, the M40 has a total of eight usable at one time inputs, and the M80 has a total of sixteen usable at one time inputs. The fact is, however, you only have 4 zone outputs on the M40 and 8 zone outputs on the M80. You can mix and match RCA and Euroblock to your heart's content. The output counts are broken down with either four (MP-M40) or eight (MP-M80) outputs to connect to amplifiers; either mixer also has one output to connect to a music on hold input for a telephone system, as well as one 3.5 mm output for cueing, whereby you can listen to what’s happening on an input without activating it. The cueing function is found on pro sound mixing boards, and may have limited utility in a traditional matrixed audio application. You’ll need to have downloaded current firmware to install either option. Get one of those USB thumbdrives from your pen drawer, make sure it’s got at least 1 GB of available capacity. You’ll configure the thumb drive first in a FAT32 format from the mixer, and then dump the firmware you’ve downloaded from your computer onto the thumb drive. Instructions are found at the QSC website. That’s a ton of capabilities for the unit! Let’s talk about what the end user can use to manipulate the system. One alternative was hinted at in the programming capabilities; you can use an Android or iOS device to control the system. The product is built well, and clearly a lot of thought and experience went into the line. It’s easy to program and easy to use. With multiple employees, you may want the manager to have complete access to each zone, yet give the bartender control over only the bar. Clearly, you can go into the programming and extend or remove permissions on an individual basis, as long as the handheld device is on the network. In addition to handheld controls, you can get an MP-MFC controller in either black or white. This wall mounted device goes into a single gang device, and allows you to select the zone you want to manipulate, the source you wish to select, and adjust the volume up or down with a visible graphic depiction. It’s a lot more professional looking to have the zone name and the music source labeled, as opposed to simply 1, 2, 3 or 4. 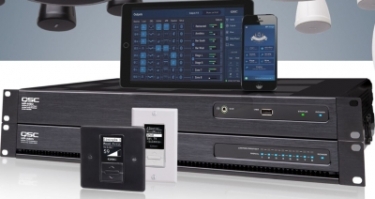 With the system programmed and installed, end users can set different things to play at different times of the day, including sources and volume levels. You can have the zone switch sources automatically if, for example, the jukebox is loaded by a patron. You can page to let someone know their table is ready, either through a microphone or via a smartphone on the network. That phone will need to have the application loaded, of course, and will need to have permission to do that paging. Once the page button is hit on the app, the manager can page the Johnson family and let them know their table is ready. When the page is done, the mixer will release the page from its digital holding cell and play it through the speakers. That delay absolutely prevents feedback from occurring in the zone. If you have a board that regularly meets, you can configure the unit so it acts as an automixer for up to either four or eight inputs. You can then have one output feed the main auditorium, the second output feed the overflow room, have the third output go to the recording system and not worry about one adjustment messing with the other two. QSC has designed a system that is more fully featured than other manufacturer’s predecessors. The product is built well, and clearly a lot of thought and experience went into the line. It’s easy to program and easy to use. Word from QSC is that they expect to allow third-party control systems to operate the system in the near future. Thanks as always for your great contributions, Fred!